After spending the last week or more in the murky darkness of the sealed portion of the hymnal, suddenly the roof’s been blown off and the hot Spanish sun comes blazing in. Hymn #58 is another hymn in the series of my favorite mission memories. Though I served in Chile, not Spain, there is something of the Spanish verve of this him that gets the blood of all Spanish speaking members rushing. We would get so worked up singing this hymn, it was like a crowd of little Chilean bowling pins trying to scurry out of the way of the rushing Spanish bull. It’s amazing how very simple notes put together in a very straightforward way can turn on such a rush of emotion and energy. This 4-line hymn is really only a 2-line hymn. Lines 1, 2 and 4 are exactly identical. Line 3 is a variation on bars 1 and 2 and it’s repeated. So really, this piece is only 6 bars long. So what is it that makes this such a favorite hymn? I think it’s the Matador Effect. The melody spins around on itself like a matador swirling his red cape around a charging bull. Line 3 keeps the street fight going but look out for the basses or you’ll get trampled. That repeated figure is intoxicating. The whole hymn is like that. The repetition, the swirling, the fear of being gored, and the consistently high tessitura throughout seems to put us in “fight of flight” psychological state. I can’t think of anything else to say. I’m all caught up in the scurrying mob. I’d better go out for a run to work off this fever pitch I’ve worked myself into. P.S. Don’t forget to subscribe! Just click below and I’ll send you a quick email every time I post a new article. 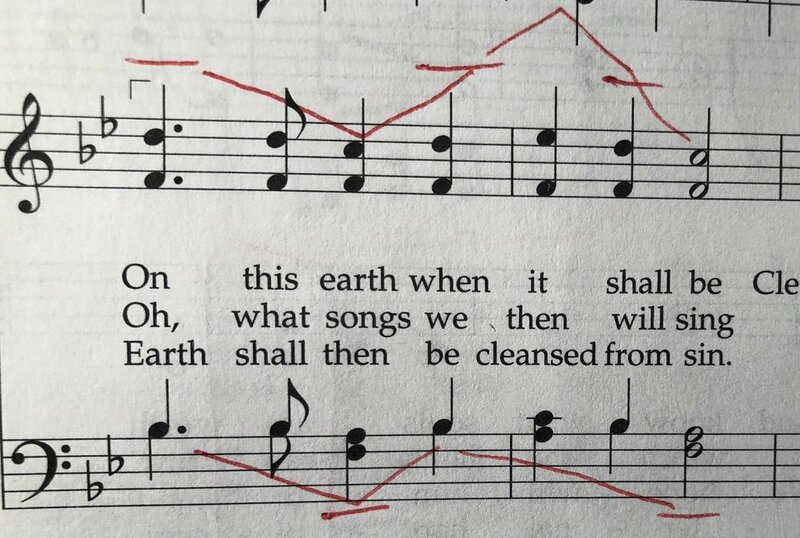 It is interesting that we can have hymns so obscure right next to hymns that find their titles in the coveted well-known list in the back of the hymnal. This hymn, I think, is one of the most well-known in the church (at least in the United States, but it does appear in a small book of hymns for use in Hungary when the church was less than ten years old in that country…), and I think is a pretty standard example of a well-written hymn. This hymn should definitely be perceived in two. Therefore the tempo must be quick enough to enable this perception. It can become stodgy and pedantic in four and too slow. A good tempo, then, would be half note equal to about 62 beats per minute. I find that to be a good exultant tempo. A full plenum (principal chorus to mixture, plus chorus reeds) is called for with this hymn, strengthening at the last verse (after all, “we will sing the songs of praise; we will shout in joyous lays!”). Older PostDo I Dare Offer Suggestions to a Tabernacle Organist?